New book, 40 pages, MAA144. King John the Good of France was captured by the English at the battle of Poitiers in 1356; his 14-year-old son Philip fought valiantly by his side until the bitter end, and as soon as he was in a position to do so, King John rewarded his son's courage and devotion by designating him Duke of Burgundy, a title that by chance had just become extinct. 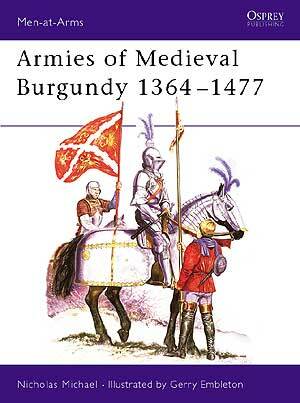 Philip was the first of the Valois Dukes of Burgundy and this fascinating text by Nicholas Michael examines the functioning and organisation of the Burgundian armies from the beginning of his reign until the time of the last of the Valois Dukes; Charles the Bold. Contents: Introduction; Organisation; Charles the Bold's Permanent Army; Artillery; The Army in the Field; Arms and Armour; The Plates.